Tracey and Alex wedding featuring Living Coral. 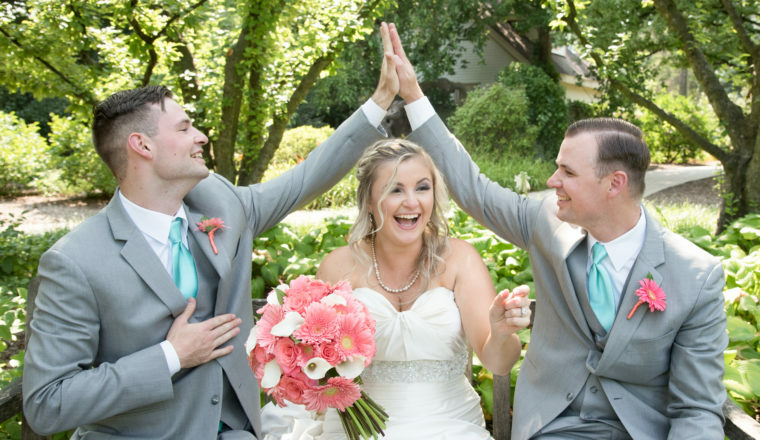 Tracey and Alex were ahead of the trend using Pantone’s color of 2019, Living Coral, for their August 2018 wedding! Tracey’s bouquet featured coral roses, coral gerbera daisies and white calla lilies. The bridesmaid’s bouquets were a combination of white and coral gerbera daisies that accented the Spa colored dresses! The two different types of centerpieces both featured cherry colored snapdragons. The first centerpiece was a trio of vases with snapdragons with floating candles. The other centerpiece was an elevated piece featuring snapdragons designed up and outward. Thank you to Kay Bee Photos for the images!